We’d love your help. Let us know what’s wrong with this preview of Cycle of Fire by Hal Clement. To ask other readers questions about Cycle of Fire, please sign up. Hal Clement's genius was in his talent to write rounded likeable characters and set them into a background of realistically thought out planets and environments. This is no exception and can be seen as a kind of bridge between Stanley G Weinbaum's 'A Martian Odyssey' and Barry B Longyear's 'Enemy Mine'. Young Nils Kruger finds himself stranded on alien world. He had earlier become separated from his colleagues on a survey expedition and they now believe him dead. This world is highly volcanic and Hal Clement's genius was in his talent to write rounded likeable characters and set them into a background of realistically thought out planets and environments. This world is highly volcanic and part of the complex orbit of one planet and two suns. Not far away is Dar Lang Ahn, an alien male whose glider crashed while he was travelling back to his home in the Ice Ramparts carrying valuable books for his people. Nils finds the alien sick and dehydrated, and shows him how to get water from the analogue cactus plants that stud the desert, which makes Nils suspect that Dar might not be a native of this world either. Communicating at first in gestures and drawings, the two begin their journey toward safety and knowledge of each other. Clement throws in cosmological and anthropological mysteries along the way which are not fully explained until quite near the end. To a certain extent novels like this shame many of today's writers who, it seems, can't be bothered to world build or create credible alien lifecycles, preferring to employ 'Star Trek' aliens who are essentially humanoid with two genders - although they may be lizards or birds - or just human with a few bumpy ridges on their noses. Clement does worldbuilding in the truest sense and this is almost a masterclass in designing a species that has evolved to survive on a world with an eccentric orbit involving two suns. Lire en anglais les commentaires de Roddy Williams ou de Charles Harrison qui vont à l'essentiel et que je rejoins complétement. Una novela típica de la Edad de Oro de la ciencia ficción, con el héroe humano (en este caso una chaval de 16 años que se queda varado en un extraño planeta con dos soles) y el compañero extraterrestre. Juntos tendrán que recorrer una buena parte del planeta para alcanzar el lugar de destino de éste último, mientras aprenden a comprenderse el uno al otro. La ciencia, como es habitual en Clement, juega un papel fundamental en la trama, no sólo como parte de la caracterización de los protagonistas Una novela típica de la Edad de Oro de la ciencia ficción, con el héroe humano (en este caso una chaval de 16 años que se queda varado en un extraño planeta con dos soles) y el compañero extraterrestre. Juntos tendrán que recorrer una buena parte del planeta para alcanzar el lugar de destino de éste último, mientras aprenden a comprenderse el uno al otro. La ciencia, como es habitual en Clement, juega un papel fundamental en la trama, no sólo como parte de la caracterización de los protagonistas, sino que el propio lector se ve involucrado mediante los "misterios" que el autor se encarga de ir sembrando, y que para resolverlos se requieren ciertos conocimientos —básicos— de astronomía, geología, etc. Incluso los nombres de los capítulos hacen alusión a ello. En la última parte de la novela la ciencia toma ya el protagonismo absoluto cuando el autor, por medio de científicos, se pone a explicar cómo funciona este mundo a varios niveles (astronómico, geológico, biológico), dando solución a los misterios planteados hasta momento —claro que si eras el típico "chico listo" al que parecen ir orientadas las obras de Clement, ya lo habías descubierto, o al menos esa parece ser la idea. En definitiva, una novela típica de su tiempo, con las debilidades que se pueden esperar de entonces: una trama bastante simple y de "aventuras", unos personajes muy arquetípicos (los secundarios no tienen mayoritariamente ni nombres, son puro decorado) y un propósito fundamental que es el de hacer pedagogía científica. Por otro lado hay que decir en favor de Clement que es de los pocos autores de la época que intenta evitar que sus alienígenas sean meras caricaturas puestas ahí para destacar lo majos, listos, y chachi piruli en general que somos los humanos. No es que lo consiga al 100%, pero al menos consigue dotarles de cierta "independencia" y cierto derecho a comportarse como la cultura diferente que son. Un humano que se queda varado en un planeta y conoce a un indígena, no humano, y se las tiene que ingeniar para sobrevivir. Muy entretenido de leer, la historia no es hoy original …pero en el 57, cuando fue escrita, tenía su punto. Interrelación entre dos especies, no superioridad de la humana, problemas de comunicación e interpretación de la forma de ser y de pensar del otro. Problemas recurrentes en la CF que se extrapolan siempre al distinto, al extraño, a las sociedades y grupos Leído en 2003. Muy entretenido de leer, la historia no es hoy original …pero en el 57, cuando fue escrita, tenía su punto. Interrelación entre dos especies, no superioridad de la humana, problemas de comunicación e interpretación de la forma de ser y de pensar del otro. Problemas recurrentes en la CF que se extrapolan siempre al distinto, al extraño, a las sociedades y grupos humanos. First I am amazed that Cycle of Fire was written in 1957, prior to satellites and any real space flight. It is truly science fiction. In this case though, there is far more science than fiction. A space opera it is not. The story is really slow. It is rare that I felt any true empathy with any of the main characters. I did fee curiosity as to which way the story would turn. All turns were very slow. The science, or rather the exposition of ideas, was more important than the plot. There are many th First I am amazed that Cycle of Fire was written in 1957, prior to satellites and any real space flight. It is truly science fiction. In this case though, there is far more science than fiction. A space opera it is not. There are many things that don’t gel. For instance crossbows are pervasive. But animals on which to use them are non-existent. And Dar’s people are basically peace loving. Perhaps the bows are there to capture the imagination of the teenage boys of 1957, its primary audience. I enjoyed the book for several reasons. It took me back to what I used to enjoy in science fiction. It made me appreciate how very different science fiction is today; it isn’t necessarily better. A child reading this may be intrigued by ideas. A person reading today’s works will more likely be taken with the story, the action. That seems sad to me. Most of what I enjoyed is external to the book itself. So I will only give it a three. None-the-less, it is very much worth the read. Много ми е вълнуващо да чета за друг свят, развил се при различни условия, с живот, стекъл се по невъобразим за мен начин. Познатата реалност ми става крехка, чуплива, чудна и смайващо случайна. А и в крайна сметка всеки човек е друг свят, развил се при различни условия, с живот, стекъл се по невъобразим за мен начин. В момента насочвам солидни дози от възхищението си тъкмо към хората, способни да създадат и съживят такъв свят. Разбира се, в по-широк смисъл всеки умел писател е способен на това. Много ми е вълнуващо да чета за друг свят, развил се при различни условия, с живот, стекъл се по невъобразим за мен начин. Познатата реалност ми става крехка, чуплива, чудна и смайващо случайна. А и в крайна сметка всеки човек е друг свят, развил се при различни условия, с живот, стекъл се по невъобразим за мен начин. В момента насочвам солидни дози от възхищението си тъкмо към хората, способни да създадат и съживят такъв свят. Разбира се, в по-широк смисъл всеки умел писател е способен на това. Създаването на цяла планета обаче си е подвиг от особено висок ранг в моята книга. Прочетена и осмислена изцяло на глас с добра компания. Приятна книжка, но не е напълно мой тип. Имаше доста моменти, които ми допаднаха, но последните 50 стр. ги дочетох на инат. A true alien novel. This book could double as a guide to first contact, alien ecology, survival and alien archeology. The races are detailed and interesting with very alien motivations. Throw in Clement's usual flair for clever chemistry, biology and physics and you get something truly brilliant. This is hard sci fi at its best which left me thinking about it for days afterwards. Perhaps not the fastest paced adventure but a perfect example of a hard science fiction thought experiment. Another fascinating story by the father of hard SF. Human, Nils Kruger, stranded on a planet with a cometary orbit around the lesser of a binary star in the Pleiades cluster, survive by cooperating with native Dar. A friendship develops and through their adventures and with the help of starship scientists discover the truth of the strange biology on this planet of fire and ice. Classic Clement! Clement is a Golden Age master of hard science fiction. In this novel he creates a fantastic world that hosts a brilliant biological example of life finding a way. At its heart this is a human/alien buddy/survival story of the highest order. It is also a reminder that great SF does not necessarily require wars or crimes or love affairs to hold the intelligent readers attention. Curiosity and exploration is quite enough. First book I've read by Hal Celement. The science is top notch and the plot intriguing. Clement's prose are quite lean, especially considering he's writing for a pulp audience. 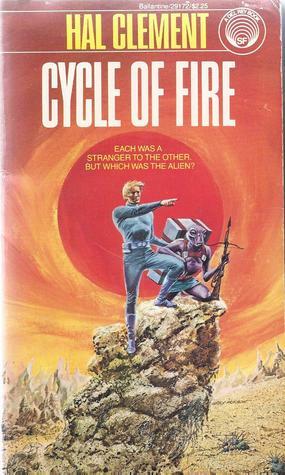 "Cycle of Fire" has an interesting plot, but was rarely exciting. The principal character is a good guy, but I struggle to call him "heroic." And that is the shame of this book; it's good, but not as good as it could have been. A solid survival-adventure story, featuring a team up between a human and an alien, both of whom are confused about the other's identity, as well as a world-building twist at the end. Quick good read. Neither the characters, nor the events, nor the science, nor the plot is sufficiently interesting to carry this book. Disappointing. Hal Clement was one of the fathers of the hard sf,his most famous novel is Mission of Gravity in the Mesklin series.This novel dont belong to that series. This novel,written in 1957,has the same charm as Mission of Gravity and is a very valuable classic hard sf novel for several reasons. In the plot is developped the no so common friendship between a stranded human in an alien earthlike planet and an alien inteligent being.The planet has two suns,it orbits a small red sun that at the same time orb Hal Clement was one of the fathers of the hard sf,his most famous novel is Mission of Gravity in the Mesklin series.This novel dont belong to that series. In the plot is developped the no so common friendship between a stranded human in an alien earthlike planet and an alien inteligent being.The planet has two suns,it orbits a small red sun that at the same time orbits a blue giant in a very eliptical orbit,the blue giant,in the Pleyades open cluster has recently captured (in geological times)the red star. All this gives way to a convoluted climatology and series of seasons that has molded the evolution of life in the planet. For all is a original novel and rigurous in the treatment of astronomy,planetology and evolution of life,also has moral questions about transference of advanced technology to alien cultures,has emotional moments and touchs the subject of the acceptance the own dead in fixed time. Has the added value that the reader is progressively discovering the misteries and enigmas of the planet and native civilization,a civilization original in its suprvivence in hard climatological environement and in its exotic way of reproductive sistem. A novel over a credible planet,credible exobiology,credible civilization and that i have enjoyed so much or perhaps more that Mission of Gravity and one of the more original classic hard sf novel i have read. A human gets stranded on an alien planet just as an alien gets stranded in his own way. The only way out of the situation is for the two to befriend each other. Despite vast differences culturally and biologically, the two of them bond together as they overcome each obstacle in their path. Hal Clement is a master of hard science fiction, and this is perhaps one of his best works. There are drawbacks to any Clement novel, of course; idealism abounds in any human character Clement writes (his ideal A human gets stranded on an alien planet just as an alien gets stranded in his own way. The only way out of the situation is for the two to befriend each other. Despite vast differences culturally and biologically, the two of them bond together as they overcome each obstacle in their path. Hal Clement is a master of hard science fiction, and this is perhaps one of his best works. There are drawbacks to any Clement novel, of course; idealism abounds in any human character Clement writes (his idealism goes too far at times), and if you're familiar with the overall theme of Clement's hard sci-fi, you'll probably be able to guess the "twist" of the final pages. But the beauty of any hard science fiction novel Clement writes is the science which leads to such an utterly amazing alien world, and Cycle of Fire is no exception to this. The biology and culture of the aliens described is stranger than anything you might find in a fantasy or soft sci-fi novel, and yet there remains a scientific basis for every seemingly outlandish idea Clement puts to paper. This book, especially toward the end, is filled with technical explanations, and I have never seen it handled in such an entertaining manner. Hal Clement *excels* when he’s given room to write. *Cycle of Fire* is even more enjoyable than *Mission of Gravity*. The basic story: a pilot on the planet Abyorman crashes due to volcanic activity, and must walk a thousand miles to deliver the very important books before he dies. Meanwhile, a cadet from Earth was left for dead after falling into a mud pit This book, especially toward the end, is filled with technical explanations, and I have never seen it handled in such an entertaining manner. Hal Clement *excels* when he’s given room to write. *Cycle of Fire* is even more enjoyable than *Mission of Gravity*. The basic story: a pilot on the planet Abyorman crashes due to volcanic activity, and must walk a thousand miles to deliver the very important books before he dies. Meanwhile, a cadet from Earth was left for dead after falling into a mud pit. In what appears to be one of Clement’s trademarks, the two races are very different, and the bulk of the book is mostly a mystery: how does Abyorman exist, and how do the people who live on it make sense? A human and an alien both find themselves stranded on a volcanic planet, and join forces in order to survive. Both are convinced that the other is a native of the planet, or at least from this area of the planet. I thought this was an interesting twist in the early part of the story. I first came across this novel in Barlowe's Guide to Extraterrestrials, so I was surprised at first that neither of the two main characters was the alien illustrated in Barlowe's guide. It takes quite some time befor A human and an alien both find themselves stranded on a volcanic planet, and join forces in order to survive. Both are convinced that the other is a native of the planet, or at least from this area of the planet. I thought this was an interesting twist in the early part of the story. I first came across this novel in Barlowe's Guide to Extraterrestrials, so I was surprised at first that neither of the two main characters was the alien illustrated in Barlowe's guide. It takes quite some time before those particular aliens make their entrance in the story. This 1957 Sci Fi classic still holds up. The physics and astronomy are correct (save faster than light travel). A stranded star traveler meets an intelligent being who is also in distress. They team up and the biology of two symbiotic intelligent species is revealed. As the planet transitions from hot to cold due to it's two-star system, one species must die for the other to be born. This is the kind of Science Fiction I grew up on. Very satisfying as a story and thought provoking. Top-notch scifi. Definitely a focus on the science side of it, but that's just how I like it. Kept me excited the whole time. Pretty quick read, now I have to look into more of his books. Hal Clement is tops for hard SF, no question. Very clever. Clement has the rare knack of writing believable aliens who are really, really, alien. Крепкий нф из 50х, для подростков. Another undistinguished science fiction novel picked up at one of the thrift stores along Morse Avenue in East Rogers Park, Chicago. I recalled Hal Clement from his Mission of Gravity probably. Harry Clement Stubbs better known by the pen name Hal Clement , was an American science fiction writer and a leader of the hard science fiction subgenre.